This article is about the year 1796. 1796 (MDCCXCVI) was a leap year starting on Friday of the Gregorian calendar and a leap year starting on Tuesday of the Julian calendar, the 1796th year of the Common Era (CE) and Anno Domini (AD) designations, the 796th year of the 2nd millennium, the 96th year of the 18th century, and the 7th year of the 1790s decade. As of the start of 1796, the Gregorian calendar was 11 days ahead of the Julian calendar, which remained in localized use until 1923. February 1 – The capital of Upper Canada is moved from Newark to York. February 9 – The Qianlong Emperor of China abdicates at age 84 to make way for his son, the Jiaqing Emperor. February 16 – The Kingdom of Great Britain is granted control of Ceylon by the Dutch. March 9 – Widow Joséphine de Beauharnais marries General Napoléon Bonaparte. March 26 – Napoleon Bonaparte arrives at Nice to take command of the Army of Italy (37,000 men and 60 guns), which is scattered in detachments as far as Genoa. March 30 – Carl Gauss obtains conditions for the constructibility by ruler and compass of regular polygons, and is able to announce that the regular 17-gon is constructible by ruler and compasses. April 2 – The only night of the supposed Shakespearean play Vortigern and Rowena (actually written by William Henry Ireland) ends in the audience's laughter. April 12 – War of the First Coalition – Battle of Montenotte: Napoleon Bonaparte gains his first victory as an army commander. April 26 – The French proclaim the Republic of Alba on the occupied territories. Two days later, King Victor Amadeus III of Sardinia signs the Armistice of Cherasco, in the headquarters of Napoleon. The fortresses of Coni, Tortoni and Alessandria, with all their guns, are given up. April 27 – Case of the Lyons Mail: During the night, five highwaymen attack the mail between Paris and Lyon, kill the postmen and steal the funds sent to the armies in Italy. May 6 – Napoleon Bonaparte forms an advanced guard (3,500 infantry and 1,500 cavalry) under General Claude Dallemagne. He sends this force along the south bank of the Po River, to cross it with boats at Piacenza. 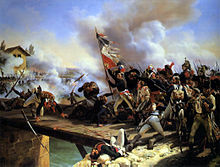 War of the First Coalition – Battle of Lodi: General Napoleon Bonaparte defeats the Austrian rearguard, in forcing a crossing of the bridge over the Adda River in Italy. The Austrians lose some 2,000 men, 14 guns, and 30 ammunition wagons. Persian Expedition of 1796: Russian troops storm Derbent. May 14 – Edward Jenner administers the first smallpox vaccination, in England. May 15 – Napoleon's troops take Milan. May 20 – The last mock Garrat Elections are held in Surrey, England. The French-Republican army divisions of the Army of Italy invade the territories of the Serenissima Repubblica di San Marco. June 6–7 – Ragunda lake in Sweden bursts and drains completely leaving the Döda fallet dry. June 21 – British explorer Mungo Park becomes the first European to reach the Niger River. June 23 – Napoleon Bonaparte seizes the Papal States, which become part of the revolutionary Cisalpine Republic. Pope Pius VI signs the Armistice of Bologna, and is forced to pay a contribution (34 million francs). July 10 – Carl Friedrich Gauss discovers that every positive integer is representable as a sum of at most 3 triangular numbers. July 11 – The United States takes possession of Detroit from Great Britain, under the terms of the Jay Treaty. July 21 – Mungo Park reaches Ségou, the capital of the Bamana Empire. July 22 – Surveyors of the Connecticut Land Company name an area in Ohio Cleveland, after Gen. Moses Cleaveland, the superintendent of the surveying party. July 29 – The Habsburg army under Marshal Wurmser advances from the Alps, and captures Rivoli and Verona. The French abandon the east bank of the Mincio River, the outnumbered division (15,000 men) of Masséna retreats towards Lake Garda. August 4 – French Revolutionary Wars: Battle of Lonato – The French Army of Italy under Napoleon crushes an Austrian brigade. August 5 – French Revolutionary Wars: Battle of Castiglione – The French Army of Italy under Napoleon defeats the Habsburg army (25,000 men) under Marshal Wurmser, who thus fails to break the Siege of Mantua (1796–97), and is forced to retreat north up the Adige Valley. August 9 – The Wearmouth Bridge in England, designed by Thomas Paine in cast iron, opens to traffic. Its span of 72 m (236 ft) makes it the world's longest single-span vehicular bridge extant at this date. August 10 – A mob of peasants overtakes the Convent of St. Peter (Bludenz, Austria) and murders Ignaz Anton von Indermauer. August 19 – Second Treaty of San Ildefonso: Spain and France form an alliance against Great Britain. September 2 – Jewish emancipation in the Batavian Republic (Netherlands). September 8 – French Revolutionary Wars: Battle of Bassano – French forces (20,000 men) under André Masséna defeat the Austrians in Veneto. Wurmser retreats towards Vicenza with just 3,500 men of his originally 11,000 left to him. September 15 – Siege of Mantua: Napoleon Bonaparte fights a pitched battle at La Favorita on the east side of the Mincio River. The Austrians withdraw into the fortress of Mantua, which is crowded nearly with 30,000 men. Within six weeks, 4,000 die from wounds or sickness. September 28 – Empress Catherine the Great signs an agreement with Great Britain, formally joining Russia to the coalition. October 19 – French Revolutionary Wars: Battle of Emmendingen – Austrian forces force the French to retreat, but commanding generals on both sides are killed. October – Jane Austen begins writing her first draft of Pride and Prejudice, under the title First Impressions (the book will not be published until 1813). November 3 – John Adams defeats Thomas Jefferson, in the U.S. presidential election. November 4 – The Treaty of Tripoli (between the United States and Tripoli) is signed at Tripoli (see also 1797). Catherine the Great dies, and is succeeded by her son Paul I of Russia. His wife Sophie Marie Dorothea of Württemberg becomes Empress consort. French forces (9,500 men) under Masséna attack the Austrian army at Fontaniva. After a desperate assault he is outnumbered, and forced to retreat to Verona. Battle of Caldiero: French forces are defeated by the Austrians at Caldiero, and pushed back to Verona. This marks Napoleon's first defeat, losing nearly 2,000 men and 2 guns. Groton, New Hampshire is incorporated as a town. November 17 – Battle of Arcole: French forces under General Napoleon defeat the Austrians at Arcole. After a bold maneuver, he outflanks the Austrian army (24,000 men) under Freiherr József Alvinczi, and cuts off its line of retreat. Alvinczi is forced to take up a defensive position behind the Brenta River. December – The British government begins work on a 40-acre (162,000 m²) site at Norman Cross, for the world's first purpose-built prisoner-of-war camp. December 7 – The U.S. Electoral College meets to elect John Adams president of the United States. December 18 – British Royal Navy ship HMS Courageux is wrecked on the Barbary Coast with the loss of 464 of the 593 onboard. The Spanish government lifts the restrictions against neutrals trading with the colonies, thus acknowledging Spain's inability to supply the colonies with needed goods and markets. Robert Burns's version of the Scots poem Auld Lang Syne is first published, in this year's volume of The Scots Musical Museum. Annual British iron production reaches 125,000 tons. ^ a b Williams, Hywel (2005). Cassell's Chronology of World History. London: Weidenfeld & Nicolson. p. 346. ISBN 0-304-35730-8. ^ Tyrrell, Henry Grattan (1911). History of Bridge Engineering. Chicago. pp. 153–154. Retrieved 2011-08-16. ^ Troyano, Leonardo Fernández (2003). Bridge Engineering: a Global Perspective. London: Thomas Telford Publishing. p. 49. ISBN 0-7277-3215-3. ^ "Sunderland Wearmouth Bridge". Wearside Online. Archived from the original on November 27, 2011. Retrieved August 16, 2011. ^ a b Burton, Reginald George (2010). Napoleon's Campaigns in Italy 1796–1797 & 1800. pp. 75–80. ISBN 978-0-85706-356-4. ^ "Time Team help unearth world's first prisoner of war camp". Daily Mail. London. 2009-07-22. Retrieved 2012-07-23. ^ "Robert Burns - Auld Lang Syne". BBC. Retrieved 2012-01-26. ^ "Catherine the Great | Biography, Facts, & Accomplishments". Encyclopedia Britannica. Retrieved 22 March 2019. This page is based on the Wikipedia article 1796; it is used under the Creative Commons Attribution-ShareAlike 3.0 Unported License (CC-BY-SA). You may redistribute it, verbatim or modified, providing that you comply with the terms of the CC-BY-SA.